Gucci Tom Ford Era Python Heels. 2004 Collection. Gold Colored Snakeskin And Leather. Made In Italy. Across Widest Part Of Bottom Sole (Balls Of Feet) - 3.6". I think the uppers are genuine snakeskin?. So pretty! When you are finished, you can check out. 100% authentic! We believe that pictures speak louder than words and do our best to show several photographs of each item, including any flaws we find. Laptop Totes & Luggage. 3-1/2” Heel. Plush Stuffed Toys. Girls (2T - 16). Boys (2T - 20). Infants (Premie - 24 Months). Sporting Goods. Pottery & China. New with out box. Only worn inside house to try on. Black suede and Snakeskin heel. Size 8.5. When you are finished, you can check out. 100% authentic! We believe that pictures speak louder than words and do our best to show several photographs of each item, including any flaws we find. view the pics! Etienne Aigner. Spanish Low Heels Shoes. IF you have any problems or concerns once you receive. Excellent used condition super pretty sandals. 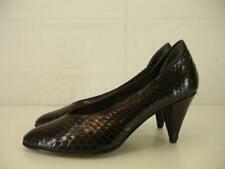 Brand: WHBM Color: black Style: snakeskin, patent leather heels Size: 6.5. Black leather & white snakeskin accented with gold chain exudes style and pure class. Tried-on only. Charlotte Russe Brown Snakeskin Heels. -Soles excellent. Beautiful Beige & Snakeskin Leather, Slim Wedge Heels, Sz 6 B, Perfect! Beautiful pair of Magdesians shoes in a Solid Beige with a Reptile print Leather on the front and on wedge of heels. Just a Beautiful, smart looking shoe! Pre-owned, but in Excellent, almost perfect condition, except for very slight wear on soles. LOAFERS SHOES Style: Loafers Shoes. It Takes a GREAT PAIR of Loafers Shoes. to Make a. Color: Beige. Don’t Miss this opportunity! GREAT DEAL! Hardware: Beige-tone. Black faux suede with black faux snakeskin trim. Condition: Good pre-owned condition. A little rubbing on the toe. Heel: 3.75" tall. Tan - Beige Snake Skin. 3.5" Heels. Classic Pump. Black embossed snakeskin w/ruched bow design. 4.25" heel. When you are finished, you can check out. 100% authentic! view the pics! ( Look these up! They are really stunning! Made in Italy. As well as being super versatile! ). Closed-toe slip-on shoes by DOLCE & GABBANA, in beige python snakeskin. - DOLCE & GABBANA - Made in Italy. - Covered heels. - SIZE: 37 (The size shown for this item is the size indicated by the designer on the shoes). We believe that pictures speak louder than words and do our best to show several photographs of each item, including any flaws we find. Color: Silver. Outsole n/a. Ball Width 3". Insole 10". Heel Height 4.25". We bring the joy of quality and luxury at cheaper prices into your hands. Rubber sole. Full leather lining. We are the-shoebarn. **EUC** Anne Taylor Women's 6M BLK Genuine Leather Snakeskin FREE SHIPPING!! These snake beauties are in great shape. Both shoes look fantastic and show little signs of wear, except on the soles. The only thing I can find is on the heel of the left shoe, one of the "scales" is slightly lifted, but could probably be glued down and not show at all (zoom in on 3rd photo and you'll see that it is barely noticeable, especially at floor level). Style:BCBG Max Azria. Stiletto heels. Very nice pair of man made leather shoes fromBCBG Max Azria so pretty and in great shape! Treaded outsoles. Original Stuart Weitzman Box Included. Stiletto Heels Style. Python Leather. Leather Lining. Leather Soles. Very little wear. Soft rounded toe. Elastic side for fastening. Genuine Snakeskin & Leather. Heel: approx: 2 1/8".